As investors turn to stocks and away from bonds in search of income, Goldman Sachs chief executive Lloyd Blankfein suggests the possible “risk of the protracted era of low interest rates fueling bubbles,” according to a recent Bloomberg article. 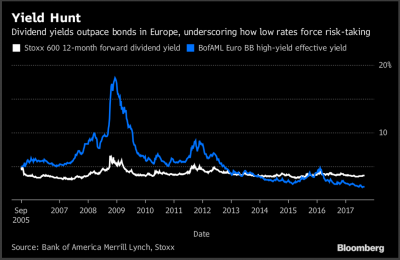 The article explains that the difference between European stock dividends and yields on low-grade debt, “which inverted in 2013, recently widened in favor of stock dividends” to the highest degree since at least 2005—evidence of increased demand for risky assets. 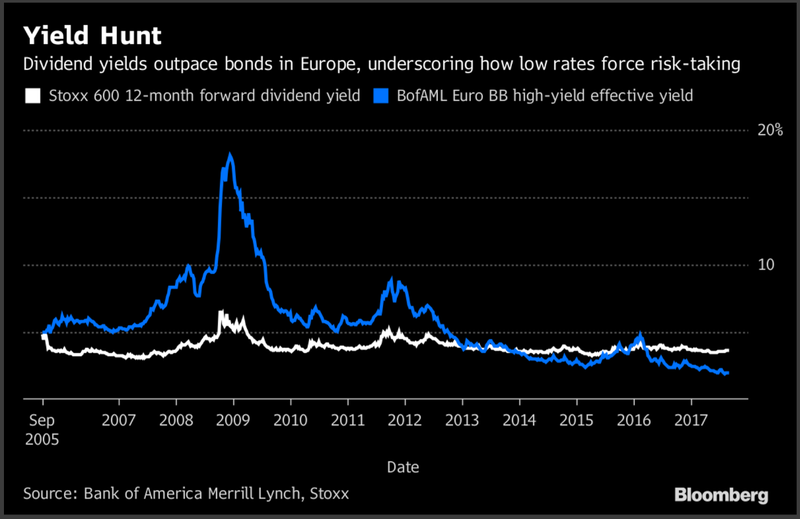 Low yields on government bonds are adding fuel to the U.S. equity price fire, the article argues, adding that treasury investors are “bereft” of income and that the S&P 500 blended 12-month forward dividend yield currently now offers higher returns than 10-year notes. “It’s all adding up to growing angst over exuberance for risky assets,” the article concludes.